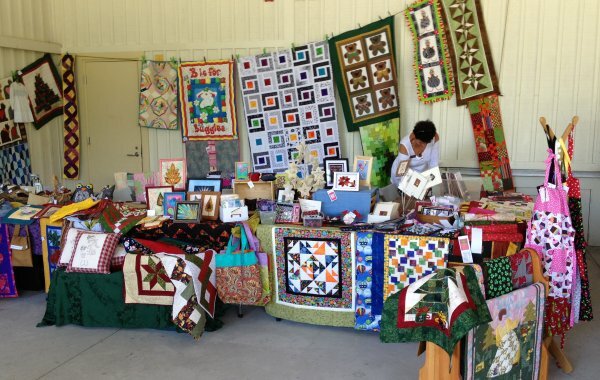 The Quilts at the Creek show at Black Creek Pioneer Village this weekend was great! 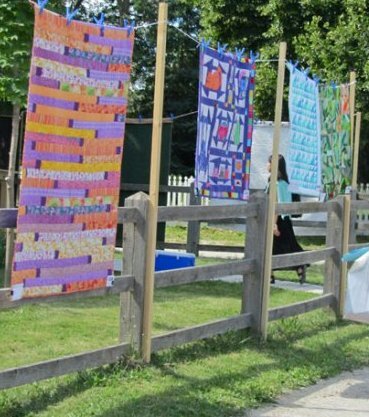 The weather couldn’t have been better and to see the quilts hanging outdoors, blowing the in breeze was fabulous! The boutique was a success…here’s a photo that shows some of the items I put in for sale. The black, white and rainbow quilt hanging in the back is mine (I’ll post a blog entry about that later), as well the Christmas Tree Wall Hanging in the front, and you can see some of my framed pieces on the table in the middle beside a box of my greeting cards and postcards. I’m pleased that a number of pieces sold! “Autumn Explosion” (I guess I should blog about that one soon – I finished it in May!) was hung indoors, and I didn’t get a picture of it. In the Quilts of Valour area, two of my quilts were hanging: The blue and white one is “Canadian Valour”, from a pattern by Pat Lore on the Quilts of Valour website. I also made the brown and gold one and it seemed to attract quilt a bit of attention. I “manned” the Quilts of Valour table on Saturday afternoon and visitors were very interested in the project. Many took pamphlets and indicated that they would like to support the cause. We talked to an ex-forces member who had served in Kosovo who was very appreciative of the project (and wished that there was such a project when he served). I also volunteered at the boutique on Saturday and on Sunday demonstrated machine quilting. 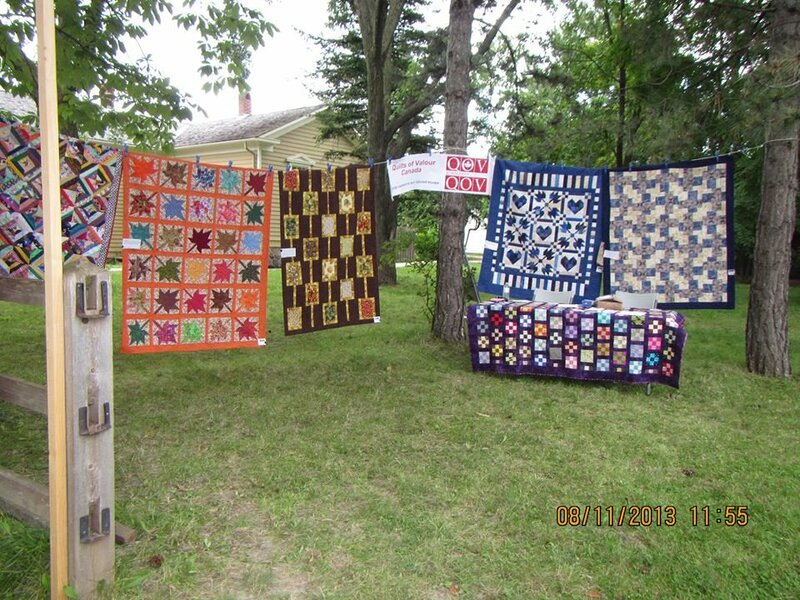 It was such fun to sit outside with my machine, beside the hand quilters, showing “then” and “now”. This entry was posted in Craft Shows, Free Motion Quilting, Quilting, Uncategorized and tagged quilting, Quilts at the Creek, Quilts of Valour. Bookmark the permalink. Canadian valour….very good idea. How do I get info. At the moment, although the page shows this quilt, the pattern that it links to is a different one. Perhaps you could contact QoV to see if the “Canadian Valour pattern is still available. There is contact information on the site. I think they had some back issues of the magazine available…….. 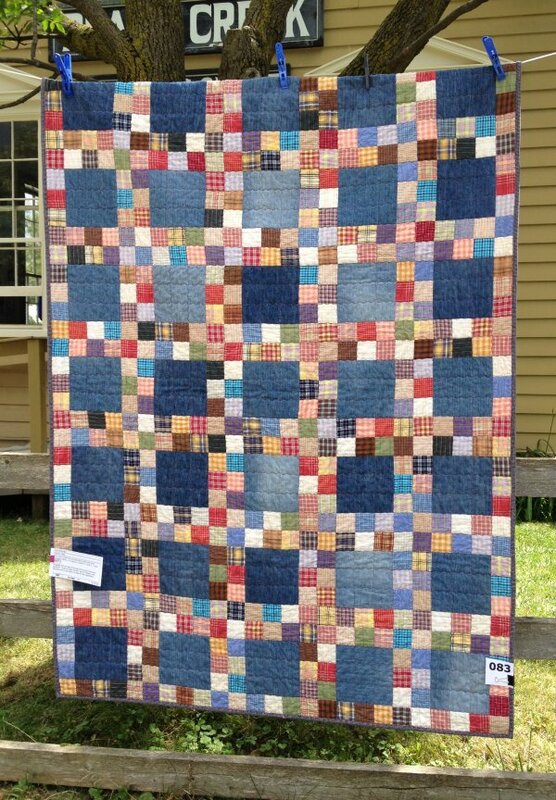 I have made this quilt before and want to make it again for my daughters wedding using her old jeans I have saved. I have lost the pattern! Have the cover and opened and the instructions are lost. This link to quilt it today is not working. Any other ideas where to get the pattern? Hello! Lovely quilts! I especially love your Country Plaids quilt. May I know where to get the pattern? Thank you!